The AR-15 is awesome… but so is the 7.62×39 cartridge. Thankfully, there are options where you can have both at the same time. Palmetto State Armory’s KS-47 might be the best of two worlds..but sometimes combining two great things often don’t turn out as you would hope. That’s why we set about putting the KS-47 to the test while also testing for magazine compatibility and making sure that even the worst of Russian ammo runs the rifle. Spoiler alert: this Slickgun can run. If you can’t wait to see more, take a look at our video Slickguns Review of the KS-47. I’m sure you know what the AK-47 is and what the AR-15 is, while both platforms have enjoyed amazing success in military, police, and civilian roles – there are some of us that want the egonomics of the AR-15, but firing the classic 7.62×39 AK-47 cartridge. And so, the KS-47 was born. While most of the parts come from the AR-15 and AR-10, the magazine, magazine lock up, and cartridge are all AK-47 style. Plus, a semi-custom barrel and bolt with a custom lower receiver. Palmetto State Armory (PSA) finishes are all basically the same, they work and are designed for real use. No one really gets excited over anodizing but it is a very economical and functional finish and PSA does it well. Besides that though, it isn’t something to write home about. All of the parts in the KS-47 worked perfectly together, nothing was loose or rattled, nothing was prone to failure. Even after a couple of thousand rounds, the KS-47 we were sent worked and looked great. Something you expect from the AK platform is that it will run every kind of 7.62×39 ammo you can think of. From mirror finished, brass cased Sellier & Bellot to dirty, found-at-the-bottom-of-a-dumpster-behind-a-Russian-nightclub, steel cased Tulammo–an AK should run it all, all of the time. In our testing, we found the KS-47 to achieve just that. No matter what kind of ammo we ran through it, every shot fired. An impressive feat from an odd amalgamation of a rifle! To achieve that level of ammo compatibility, the KS-47 has to be a bit over gassed though. While shooting outdoors this wasn’t a problem at all, but if you wanted to suppress it or shoot indoors it might become an issue. But that’s nothing that an adjustable gas block can’t fix! Using decent brass cased ammo, the KS-47 was surprisingly accurate at 100-yards. While not a precision rifle, 2 to 3 MOA is respectable for the cartridge and platform. Tula ammo opened up as you would expect to a 3-4 MOA range, but that is what you get with budget bulk steel. Ringing steel plates was also a breeze, thanks in part to the accuracy of the rifle, but also the improved AR-15-esque ergonomics and the Picatinny rail on top that allows for mounting a huge range of dots and scopes. Our testing used the EOTech EXPS, Vortex Strikefire II, and Vortex Strike Eagle 1-6x. All of the optics performed great and had zero issues with the increased recoil of the larger cartridge. Due to the cartridge, the slight over gassing of the system, and the light weight of the rifle, recoil is a good bit more intense than a normal 5.56 AR-15 but slightly lighter than say a WASR-10 AK-47. The impulse of the recoil is also notably less sharp than an AK, and that feels nice on the shoulder. While we didn’t get a chance, you could play around with buffer weights and an adjustable gas block to tune the rifle for your ammo and make it very comfortable to plink with. This would also be a great platform for hunting game, like hogs. All rifle platforms have things that are different about them. Not really problems, just differences that you need to keep in mind. The KS-47 is no different, but it is unique since it has elements from both the AR-15 and AK-47. The KS-47 uses AK-47 type magazines and the rock-and-lock you would expect from those mags, but not all AK-47 magazines will function with the SKS-47. PSA’s website lists a wide verity of magazines that will work in the KS-47 including Romanian, Korean, and Chinese sticks and drums, plus Yugoslavian, Hungarian, and Russian stick magazines. Personally, we tested Magpul AK-47 PMAGs, Steel Bulgarian mags, and Tapco 10-round mags. All of them worked flawlessly and even allowed us to perform the cool Russian-bump reload! With a larger caliber, the KS-47 needed to employ a stiffer buffer spring than even a standard AR-15 can deliver, so PSA went with an AR-10 carbine length spring. 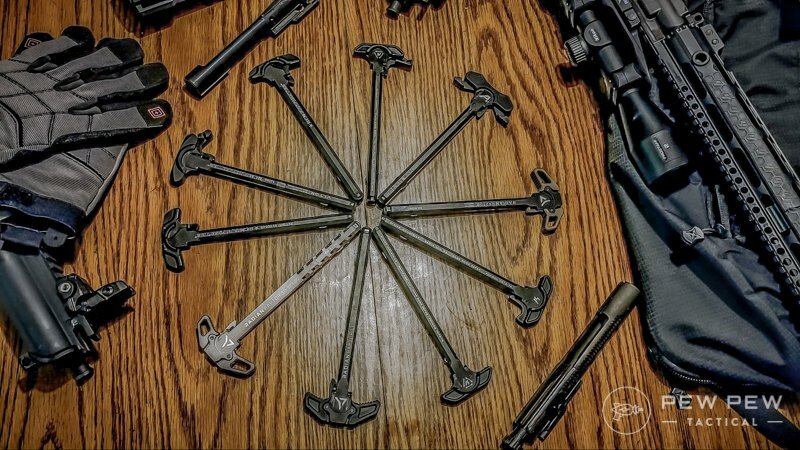 This makes for a fairly stiff spring to charge, so we recommend using an improved charging handle just to make things a little easier. The KS-47 also lacks a bolt hold-open of any kind and doesn’t have the ability to add one. While this isn’t a huge deal, it does mean that you’ll be spending more time pulling that stiff charging handle then you would normally do with an AR-15–reinforcing our recommendation that you upgrade it! We’d love to see an LRBHO incorporated in the future, but for now, PSA hasn’t said if they have any plans to do so. Everything we fed the KS-47 worked perfectly, zero malfunctions or failures throughout the 1,000+ rounds we tested. 7.62×39 isn’t the most accurate cartridge and brands like Wolf and Tulammo aren’t known for precision–so the 2 to 3 MOA we got was reasonable, but not impressive. Good enough for hogs, home defense, or plinking though! We love the improved ergonomics, the pistol grip, adjustable buttstock, nice trigger… all of it just works. However, having to charge the rifle more often than normal does make for some awkward reloads that will take some time to get used to. Looks are subjective, but I dig the look of the KS-47. Part AK, part AR, it looks a little funny at first but I like it. 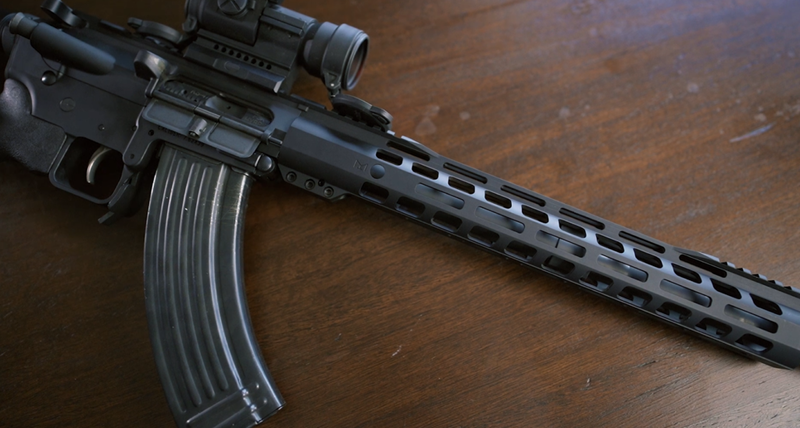 M-LOK handguard and compatibility with most AR-15 parts make the KS-47 very customizable. You can even upgrade most of the internals since it takes a standard AR trigger and bolt carrier, while the bolt is 7.62×39 and the barrel is a normal AR-15 barrel chambered for 7.62×39. This gives you a wide range of aftermarket options if you’re interested. Coming in at between $600 and $700 the KS-47 is a great price for a good rifle. It even comes in pistol versions or as a separate upper/lower so that you can SBR it if you wanted to! Just know though that the 10.5″ version is a beast to shoot–very loud, very fun, but not entirely pleasant for a long plinking session. Maybe you want a cool new plinker, maybe you’re looking for a .30cal suppressor host that is a little different from the rest, maybe you have a hog problem you want to take care of – the KS-47 is a great tool and a really fun toy. We really enjoyed shooting it and really dig the interesting innovation and initiation that PSA took to make it, we’re looking forward to what comes out next! Do you have an AR-15 in 7.62×39? How do you like it? Tell us about it in the comments! And don’t forget to take a look at some more awesome offerings from PSA like the .308 PA-10 or the 9mm PX-9! The post [Slickguns Review] Palmetto State Armory KS-47 Gen 2: Hands-On appeared first on Pew Pew Tactical.